Capt. 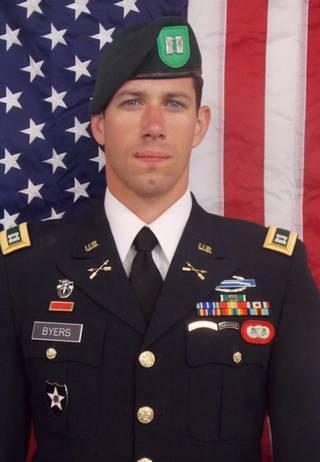 Andrew Byers was killed Thursday in Afghanistan. Capt. Andrew D. Byers, 30, has been identified as one of two U.S. service members killed Thursday in a skirmish with the Taliban. Byers and Sgt. 1st Class Ryan Gloyer died in Kunduz, Afghanistan in the battle. Both were assigned to B Company, 2nd Battalion, 10th Special Forces Group, at Fort Carson, Colorado. Along with the two soldiers, 26 civilians and three Afghan troops were killed. Four other American troops were wounded. Byers is the son of former Clarence School Board president David Byers. He is a 2004 graduate of Clarence High School. He has family in North Carolina who were notified of his death on Thursday. Byers' many awards and decorations included the Bronze Star Medal and Purple Heart.